Hyderabad: Despite the Met department predicting “few spells of rain or thundershowers at some areas on August 31” for Hyderabad, from 8.30 am on Wednesday, the city received heavy to very heavy rainfall with many localities reporting more than 9 cm of rain. 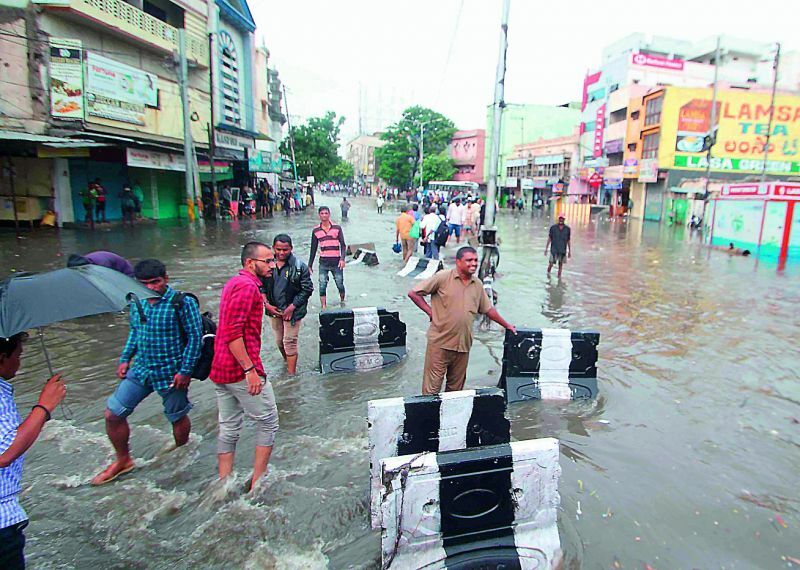 With the Met department once again failing to predict the weather correctly, GHMC and HMWS&SB were left unprepared to tackle Wednesday’s deluge. 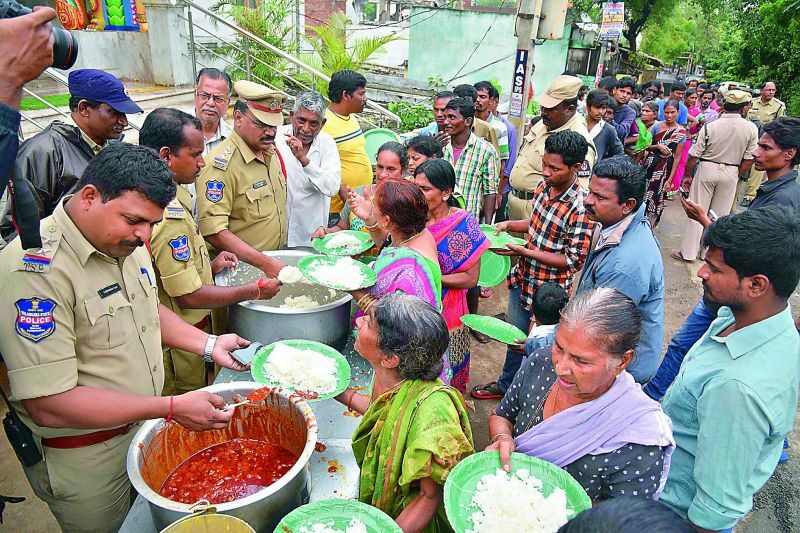 Police personnel serve people food and milk after Nagamaiah Kunta was inundated in Wednesday’s rains. 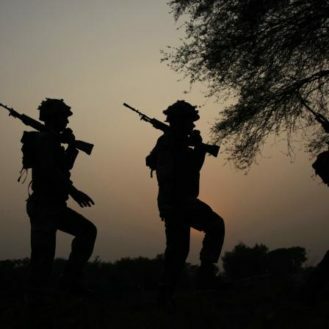 “Moreover, a north-south trough is expected to develop and run from north Bihar up to Telangana. Owing to this phenomenon, moderate to heavy monsoon rains are expected to occur in Hyderabad and the adjoining areas over the next 48 hours. The intensity of the rain is expected to increase. During the last 24 hours, the city has recorded 17.6 mm of monsoon showers. In fact, flash flooding and water-logging is a possibility in some areas,” it said. In the month of August, Telangana recorded 6 per cent deficit rainfall with only Karimnagar and Nalgonda districts crossing the mark. The GHMC does not have a meteorologist or its own weather monitoring system and relies on the IMD. 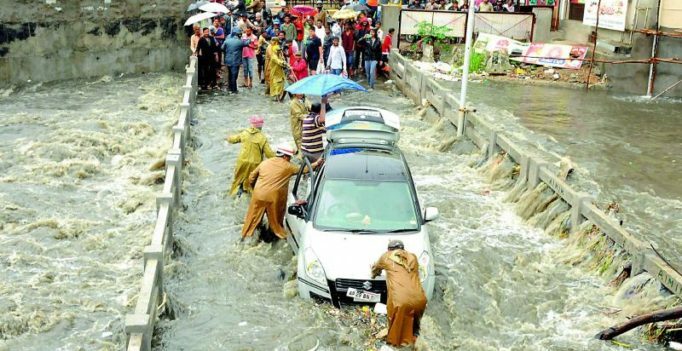 IMD mails forecast reports to the GHMC daily, but only after the city is battered with rain that the GHMC begins work. There is no concept of “nowcast”, which would give current reports. GHMC had boasted about weather boards that would be displayed as part of the Intelligent Transport system. There is no sign of that. Widespread rain in Vikarabad over the last two days have not filled the city’s twin reservoirs Osmansagar and Himayat-sagar. Manjeera and Akkampally barrage, however, received good inflows. Water Board executive director T.V. Satyanarayana explained, “Inflows have reached Osmansagar but we cannot quantify it at the moment. The figures will be released on September 1. There have been no inflows into Himayatsagar. If the four reservoirs fill up, the Water Board will get a boost to its supply. As of now, the city receives 355 MGD from the Krishna Phases 1, 2 and 3, and the Godavari Phase-1 projects. Following heavy rainfall, officials alerted downstream localities along the Eesi, Musi and Kagna Rovers. Peddemul mandal recorded the highest rainfall with 218 mm and Parigi with 212.4 mm. Transport minister P. Mahender Reddy held a review meeting with Ranga Reddy district and irrigation officials on the matter on Wednesday evening. He directed revenue and irrigation officials to alert public on the possible threats on breaching of bunds of lakes and tanks.